Practice Bioprocess Engineering questions and answers for interviews, campus placements, online tests, aptitude tests, quizzes and competitive exams. This set of Bioprocess Engineering Assessment Questions and Answers focuses on “Role of Shear in Stirred Fermenters”. 1. Which type of forces stretch and distort the bubbles? Explanation: Shear forces in turbulent eddies stretch and distort the bubbles and break them into smaller sizes; at the same time, surface tension at the gas-liquid interface tends to restore the bubbles to their spherical shape. In the case of solid material such as cell flocs or aggregates, shear forces in turbulent flow are resisted by the mechanical strength of the particles. 2. Viscosity is inversely proportional to the size of eddies? Explanation: If the viscosity of the fluid is increased, the size of the smallest eddies also increases. Increasing the fluid viscosity should, therefore, reduce shear damage in bioreactors. 3. Larger foam is produced in bioreactors with increased headspace and small workspace? Explanation: A bioreactor is divided in a working volume and a headspace volume. The working volume is the fraction of the total volume taken up by the medium, microbes, and gas bubbles. The remaining volume is called the headspace. Typically, the working volume will be 70-80% of the total fermenter volume. This value will however depend on the rate of foam formation during the reactor. If the medium or the fermentation has a tendency to foam, then a larger headspace and smaller working volume will need to be used. 4.” Instrument air compressor” should be used generally as a compressor? Explanation: Note that it is very important that an “instrument air” compressor is not used. Instrument air is typically generated at higher pressures but is aspirated with oil. Instrument air compressors are used for pneumatic control. Air compressors used for large scale bioreactors typically produce air at 250 kPa. The air should be dry and oil free so as to not block the inlet air filter or contaminate the medium. 5. What is the function of Pluronic f-68? Explanation: Pluronic F68 is used in cell culture as a stabilizer of cell membranes protecting from membrane shearing and additionally acts as an anti-foaming agent. It is a non-ionic surfactant used to control shear forces in suspension cultures. It can also be used to reduce foaming in stirred cultures and reduce cell attachment to glass. It is provided at a concentration of 10% and effective at a working concentration of 0.1%. 6. Microcarrier beads 120 μm in diameter are used to culture recombinant CHO cells for production of growth hormone. It is proposed to use a 6-cm turbine impeller to mix the culture in a 3.5-1itre stirred tank. Air and carbon dioxide are supplied by flow through the reactor headspace. The microcarrier suspension has a density of approximately 1010 kg m-3 and a viscosity of 1.3 x 10-3 Pa s. Estimate the kinematic viscosity. 7. 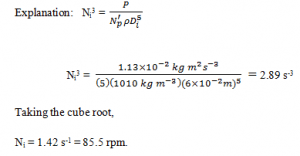 Refer to Q6, and calculate the power dissipated per unit mass of fluid. 8. Referring to Q6 and Q7 and, calculate the stirrer power. P= 1.13×10-2kgm2s -3 = 1.13x 10-2W. 10. What is the function of microcarrier beads? Explanation: The microcarrier beads are used to increase the number of adherent cells per flask and are either dextran or glass based, they come in a range of densities and sizes. The beads are buoyant and therefore can be used with spinner culture flasks. The surface area available for cell growth on these beads is huge. It is a support matrix allowing for the growth of adherent cells in bioreactors. 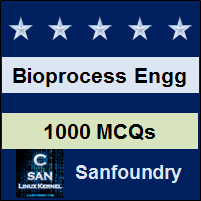 Sanfoundry Global Education & Learning Series – Bioprocess Engineering. To practice all areas of Bioprocess Engineering Assessment Questions, here is complete set of 1000+ Multiple Choice Questions and Answers.